Hi. I'm Ben, AA7AS. You should meet Deb, too, as without her unconditional and cheerful support, this project wouldn't have even gotten started. I'm the fellow who develops SdrDx. 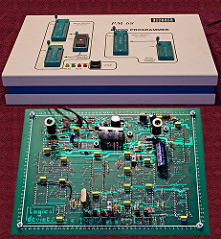 I've been an amateur radio operator since the late 1970's, and I finally picked up my extra — complete with 20 WPM code — in the 1990's sometime. I'm an engineering type, although these days I mainly write software. 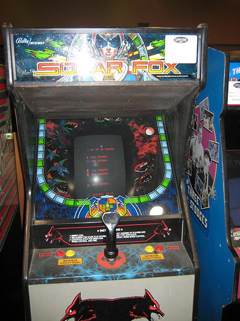 As a hardware guy, I designed video game hardware from the ground up and wrote sound generation software for Centuri, Bally-Midway, Arcade Engineering and Techstar. I worked at IBM Boca Raton, working on custom 4-bit microprocessor systems for a multi-printhead Kanji printer system. I designed the AVT SSTV system for AEA corporation. You can see it here. I did test instrument design for MCI/Sony for recording consoles. I did the electronics for a smart bottle cap that controlled pouring in bars. I've done RF from barely above audio to microwave, and just as much audio work. I've done EPROM and CPU programmers, noise-reduction hardware, mixers, A/D and D/A cards, graphics cards, portable heart monitors... I could really go on for a while, there's lots more. I had a long hardware-oriented career, and I enjoyed doing different things. Eventually, I started my own company. 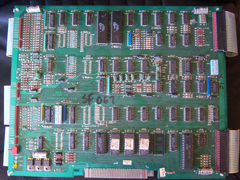 We made graphics accelerators, fax modems, AFSK modems, and other things. The company evolved, inevitably, into a pure software operation as US electronics manufacturing continually lost ground to the lower labor cost advantages Asian manufacturers brought to the table. In software, I've done AI and AL work, written compilers, linkers and assemblers, small operating systems, terminals, boot roms (monitors), integrated POS and inventory management systems, auto-routing PCB layout systems and schematic capture software, all manner of graphics software from paint systems to image editors to ray tracers, authoring systems, and arcade games and/or sound subsystems. I've done PD software for the handicapped including point-to-speech and specialized text input systems, as well as various other free undertakings -- a small database engine, an auroral status monitoring app, a map interpolator for NOAA temperature data, etc. I prefer C, but also write in C++ and Objective C; I know more assembly languages than I have fingers and toes (and no, I've got 'em all, lol) For HLL's, I prefer the Python 2 version of Python, which I think offers a near-optimum mix of power and simplicity. With that kind of background, not only is SdrDx a natural fit to my skills, it's fun and entertaining. Of all the code I've written, this is the only non-commercial project that, considerably more than four years later, I'm both still using and still actively developing. The whole SDR thing is absolutely fascinating to me. More? Really? Well, if you're still curious, you are cordially invited to my flickr image stream, where you can surf around my hobbies, home project (building an interior into an old church), my cats, astro- and auroral-photography undertakings, and so forth. As I write this, I have over a thousand photos online -- I'm pretty sure you'll get bored before you look at them all.